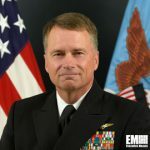 James Winnefeld Jr., a retired U.S. Navy admiral and former vice chairman of the Joint Chiefs of Staff, has been elected to Raytheon‘s (NYSE: RTN) board of directors. The 37-year Navy veteran previously led the North American Aerospace Defense Command and the U.S. Northern Command, Raytheon said Wednesday. “Sandy brings significant expertise to our Board, including deep knowledge of the future capability needs of our customers, ” said Raytheon Chairman and CEO Thomas Kennedy. “His strong understanding of the evolving international environment as well as his critical thinking on emerging technologies will be of great benefit to our company as we execute our global growth strategy, ” Kennedy added. Winnefeld’s military career includes at-sea assignments such as commander of Carrier Strike Group Two/Theodore Roosevelt Carrier Strike Group, U.S. 6th Fleet, NATO Allied Joint Command in Lisbon and Striking and Support Forces NATO. He also worked as senior aide to the Joint Chiefs of Staff chairman and executive assistant to the vice chief of naval operations as well as held a director role at the Joint Forces Command, U.S. Fleet Forces Command and Joint Staff.